This recurring promotion is back at Amazon. You pay $45, and get a $50 Google Play e-gift card by email using coupon code GOOGLE in the Amazon shopping cart. That’s a 10% off discount. You can get a better percentage during various B&M store gift card promotions, but typically the percentage is achieved through store credit or rewards points. This is a straight-up discount, nothing else involved. It is a limited time offer, expiration time unknown (= when the coupon stops working). PS: Google Play gift cards can also be used towards subscriptions initiated from Google Play, as long as that subscription service supports billing through Google Play (eg HBO NOW). You can adjust it at any time under the Subscriptions section of the Google Play Store website or app. Free for the next five days and change (from blog-posting date) is the typically not-free Google Play app Silent Camera (Silent Mode) by Gazami software. The purpose of the app is to silence your smartphone’s built-in camera if you can’t turn off all the annoying consumer-y sounds from your phone’s own camera menus. This sale ended… For a limited time, the PRO version of the Framelapse time-lapse Android app by Neximo Labs is on sale for $0.99 (instead of its regular price of $2.99) at Google Play. Note that MediaTEK devices are NOT supported. If you are part of the Google PLAY ecosystem, for a limited time, the premium (for pay) app Fast Camera – HD Camera is FREE to own. It typically goes for $1.99. The developer makes three versions of this app, this is their most advanced app that is free for a limited time. Speaking of app stores, one of the Apple announcements that flew under the radar, starting with the new iTunes version 12.7, the App Store will be removed from the desktop iTunes software. If you used that to manage or download apps (eg your iOS device wasn’t compatible with an app, but wanted to grab it for the future because it was free or it was on sale), make sure you keep one iTunes installation at a previous version. 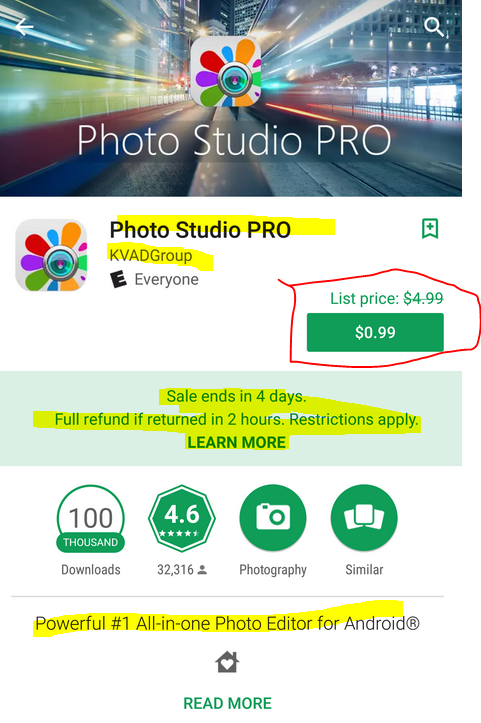 A limited time offer at the Google PLAY Android app store has the Photo Studio PRO app by KVAD Group on sale for 99c instead of its standard price of $4.99. Per the Play page, they offer a full refund if returned within two hours. The app averages 4.6 out of 5, and it has over 100,000 downloads per Google Play. It is currently #31 in the Top Paid apps over there. If you live in the Android Google PLAY ecosystem, CVS B&M stores offer $10 back in CVS ExtraBucks when you purchase a $50 Google PLAY gift card until Saturday night (June 27, 2017). Limit one per customer for the week. Of interest if you buy camera and photo e-books or apps or photography documentaries (or any other content) from Google PLAY. If you are using Google Play Android apps, including the gazillion photo apps there, and you have multiple family members and/or your own multiple Google accounts, you may be able to share those apps with other family members and Google accounts with the new Google Play Family Library and not have to purchase them individually for each person/account. What exactly qualifies is NOT straightforward. It depends on the type of content, when it was purchased, the wishes of the maker, and how it was purchased. You can de-tangle the mess by reading the Support page. 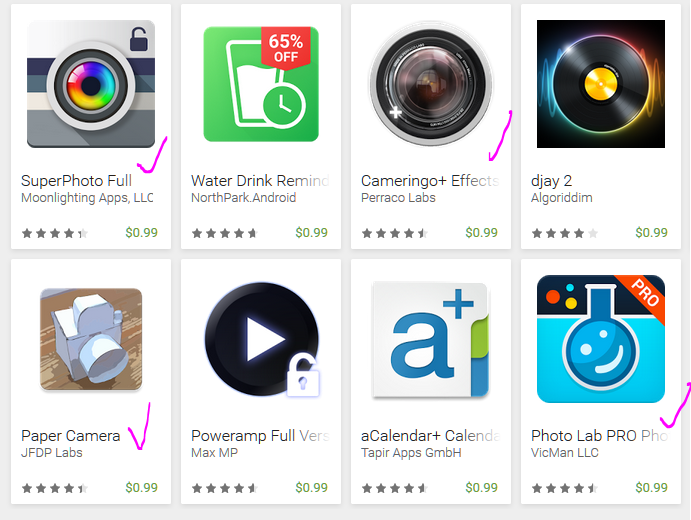 Google Play is having another 99c app play and among the options available in this sale are two popular photography apps, Camera Zoom FX Premium by androidslide and Photo Lab PRO Photo Editor! by VicMan LLC. This is a limited time sale (I don’t know when it expires). Other well known apps participating include Nova Launcher Prime, PowerAmp Full, and Ultimate Guitar Tabs. For a limited time, celebrating something or so, Google Play has a variety of nice digital content sales. Of photography interest, they have a $1 App Sale that includes eight different photography apps: Paper Camera, Photo Lab PRO, SuperPhoto Full, Cameringo+, DMD Panorama, Photo Editor Color Effect PRO and Color Splash and Photo Editor HDR FX PRO (the last three by Lyrebird Studio). Also part of the sale are other well-known apps such as the Nova Prime Launcher, PowerAMP, and a couple of Calendar apps. TIP: if you are reading this on an Android device, you can easily get to the sale by going to the App section of the Google Play store. This is the second to last promotion shown in the featured slideshow of special offers. If you are part of the Google Play Android ecosystem and you want to stock up on Android camera and photo apps or in-app purchases, and if you are participating in the Plenti Rewards program, good until February 7 (2016) you earn 20% back in Plenti Rewards when you purchase a $25 Google Play Gift Card at Rite Aid brick and mortar stores. The offer is limit two during the week. You can use them on anything at Google Play, not just camera/photo. These rarely get discounted, so it’s a good opportunity… NOTE: you can’t use these to buy hardware or recurring subscriptions. This limited time sale ended. It is back to $4 as of 10/6/15… The Photo Studio Pro all in one Android photography app by KVADGroup is now on sale for $2 at Google Play. Requires Android 2.3.3 or later. It averages 4.6 out of 5 with 21K+ ratings… If you want to get a feel for it, they have a free non-Pro version. This limited time offer ended… At Rite Aid brick and mortar stores, for Thursday, Friday and Saturday, you can get a $6 Reward back when you purchase a $25 Google Play Gift Card. Limit two per customer during this promotional period. This is essentially a 24% off discount. Think along the lines of Android Camera and Photo apps (including the two Photoshop Touch versions) along with camera and photography e-books in Google Play Books… UPDATE: for iTunes fans, buy iTunes $30 multipack (three $10 gift cards), get $10 Walgreens gift card (effectively a 33% off discount) at Walgreens brick and mortar stores (expires Saturday night). For a limited time, the Camera ZOOM FX Premium photography app (with tablet support) is on sale for $2 at the Google Play Android App store. Speaking of which, also on sale, for $3 is the MyBackupPro app.